Lucky Leaf brings us yet another great recipe using their delicious pie fillings. 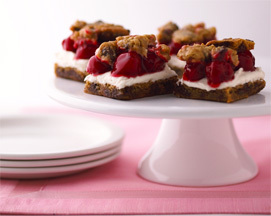 Chocolate Chip Cherry Bars are what you’d get if a chocolate chip cookie and a cherry cheesecake got married and had a baby. This recipe is super easy to make. I used my trusty new KitchenAid Mixer to help beat the cream cheese mixtures. I almost burned the cookie crust, but fortunately my oven was kind enough not to burn the crust. 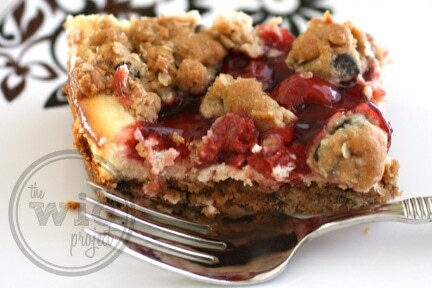 The end results is a sweet, cheesecake-like treat topped with cherries! I think mine looks pretty good, even when compared to the official picture, right? Remember that Lucky Leaf Pie Fillings can be used for more than just pies. Cakes, targets, brownies, and bars can all be transformed with a little bit of fruit. Preheat oven to 350°F. Lightly grease a 9x9x2-inch baking pan; set aside. In a large bowl break the cookie dough into chunks. Knead in oats. Press two-thirds of this mixture into the bottom prepared pan. Bake for 12 to 15 minutes or until crust is set. Meanwhile, in a medium bowl beat cream cheese and sugar until smooth. Stir in egg and vanilla. Carefully spread cream cheese mixture evenly over crust. Top with cherry pie filling. Dot the remaining cookie dough over the pie filling. Bake for 20 to 25 minutes more or until top is lightly browned and center appears set when lightly shaken. Cool completely. Cover and chill 2 hours to overnight before serving. Makes 16 bars. Oh my!! Looking at that picture in the middle of the night isn’t good. Now I want to go raid the fridge for something sweet & gooey! I am supposed to be dieting! 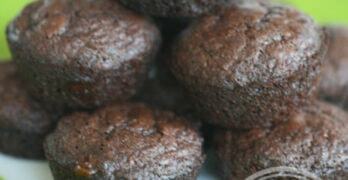 These look so yummy- thank u 4 the recipe! i had to print this. 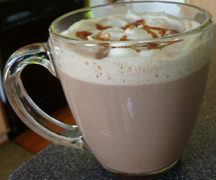 as if it doesnt look good enough already…i think i would have to drizzle on some chocolate syrup.